Question: I have a collection company threatening me with a lawsuit on a credit card account form 1998 they purchased the account in 2009 and they say the statute of limitation begins again — the original less than $1,000 balance is now $4,000 Can they do this legally??? Answer: Generally, a debt that old is out of statute of limitations and you cannot legally be sued for the debt. But that does not mean a bottom-feeder debt collector will not attempt to sue you for the debt. Unpaid debt can be sold from debt collector to debt collector until it is paid. But legally, once the statute of limitations has passed, consumers cannot be sued for the debt. Unless you did something to re-start the statute of limitations which means you can be legally sued for the debt. 1. Check your State’s Statute of Limitations. Once you know the date when the statute of limitations passed, you can safely be sure the debt is uncollectible. You do not need to inform or argue with the debt collector about the statute of limitations. They already know the statute of limitations has passed. The debt collector is simply trying to deceive you about the statute of limitations in hopes you will agree to pay. 2. Check your credit reports. Make sure they are not fraudulently reporting the debt on your credit reports; if so, they are in violation as well as the credit bureaus for reporting older or re-aged debts. A credit card debt can only be reported 7.5 years on your credit report. It does not matter how many debt collectors purchase the debt and try to collect. Once a credit card debt has been charged off and 7.5 years has passed, the original creditor along with any associated debt collector cannot report the debt on your credit reports –ever. 3. Stay off the telephone. Send a certified, return receipt letter to the debt collector stating telephone calls are inconvenient and only written communication is allowed. Although you could request no contact at all, you want to keep the written lines of communication open to stay on top of what is happening. In addition to requesting only written communication, request they send you documentation proving the statute of limitation has not run. I doubt very seriously they can produce any proof but request it anyway. You want to create a paper trail just in case they proceed with a lawsuit. 4. Lawsuit and Violations. It is a violation of the Fair Debt Collection Practices Act, § 807. False or misleading representations — for a debt collector to threaten to take any action that cannot legally be taken or that is not intended to be taken. But do not mention this in your letter to them. Let them hang themselves. With enough violations, it may be worth you suing them. At this point, all you need to know is the statute of limitation has passed. As long as you did nothing to restart the statute of limitations, your job will be to look out for a lawsuit and make sure your credit reports are accurate. 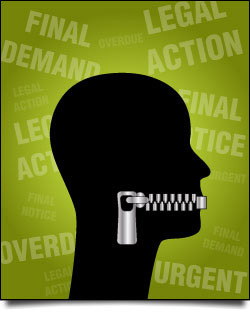 Should the debt collector proceed against you in court, your main defense will be the statute of limitations. It is imperative that you respond to the lawsuit if you are sued. Debt collectors count on consumers not responding which results in an automatic judgment against consumers. If only consumers stay on top of things and know their rights, most debt collection lawsuits would end up in favor of the consumer. By simply answering the lawsuit, appearing in court and asserting the statute of limitations as a defense, the court will dismiss the case. (1) Debt collectors almost never attach or can produce the original signed credit card application or agreement. (2) Debt collection lawsuits typically fail to state facts essential to a cause of action for a credit card contract including date of contract, dates and amounts of charges, fees or other debts incurred under the contract. (3) Debt collectors generally have no evidence they are the real party in interest. Many claim they are the owner and holder of the debt pursuant to an assignment agreement from the original creditor; but, they cannot produce the assignment when challenged. Debt collectors typically have no assignment of debt from the original creditor. Debt collectors may have a purchase agreement showing they bought 1000s of old credit card account debts for literally pennies on the dollar but that does not make them the real party in interest. (4) Debt collectors seek to unjustly enrich themselves. As you stated the original debt was for less than $1,000, now they are requesting over $4,000. Another affirmative defense to a lawsuit could be unjust enrichment. The amount the debt collector is requesting in the lawsuit would result in them receiving more money than they are entitled to. As you can see even if they do file a lawsuit, as long as you answer and assert your affirmative defenses, most debt collectors have no evidence to make their case. Just keep on top of all correspondence, monitor your credit reports and respond if a lawsuit is filed. You should be just fine. The best of luck to you.